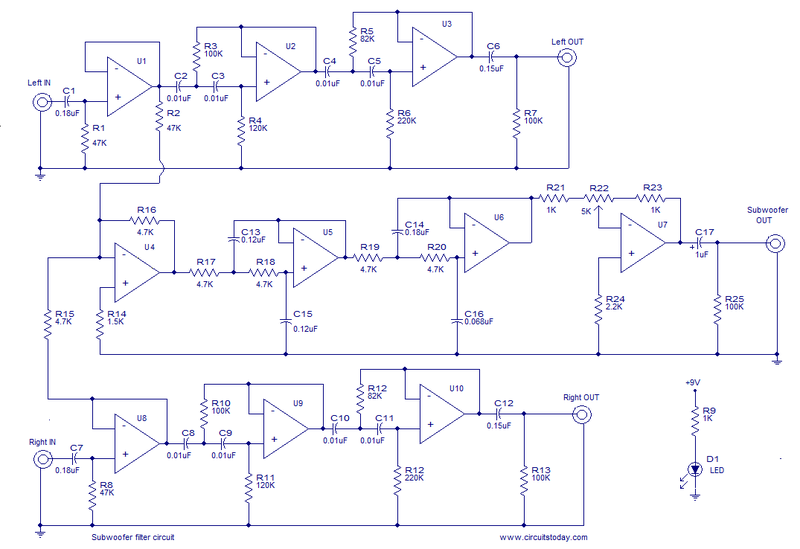 Here is the circuit diagram of an opamp based subwoofer filter. Audio frequencies below 200Hz are considered to be in the subwoofer range. So a subwoofer filter will be essentially a low pass filter with a cut off frequency of 200Hz.The working of this straight forward circuit is as follows. The left channel of the audio source is connected to the non-inverting input of opamp U1 which is wired as a buffer. Opamps U2 and U3 forms a high pass filter. Output of U1 is coupled the input of this high pass filter .The high pass filtered audio signal available at the output of U3 represents left channel output. Similarly the right channel of the audio source is connected to the non-inverting input of U8 which wired as a buffer amplifier. The output of U8 is connected to the input of the high pass filter formed by opamps U9 and U10. The filtered audio signal available at the output of U10 represents the right channel audio output. Output of U1 and U8 are coupled to the inverting input of the opamp U4.U4 performs the job of mixing the two signals. Output of U4 is coupled to the input of the low pass filter comprising of opamps U5 and U6.The low pass filter has a cut off frequency of 200Hz.The output of the filter is coupled to the inverting input of opamp U7 through the POT R22. U7 works as an output amplifier and POT R22 can be used for adjusting the gain. The audio signal available at the output of U7 represents the subwoofer output. The ICs U1 to U 10 are all opamps and you can use any opamp with a split power supply. I used two TL074(quad opamp) and one TL072(dual opamp). I used +9/-9 V DC dual supply for powering the circuit. The power supply connection is not shown in the circuit .Positive and negative supplies must be connected to the appropriate pins of the IC by yourself. Pin configuration of your opamp can be understood from its datasheet. It is better to mount the ICs on a holder. LED D1 is just a power ON indicator and it is optional. Some capacitance values shown in the circuit are hard to find in the market. The best solution is to combine available capacitors serially or parallely to obtain the required value. can i use this circuit on my car subwoofer? car power has only 12 volts positive and ground. if i make a power supply with virtual ground from 12 volts car battery i could only produce 6 volt positive and 6 volts negative with center tap ground. is the 6 volts symmetric power enough to power the circuit and produce the same output qualty? Thank you and i hope for your fast reply. R2 is 4.7k not 47k. can i use electrolytic capacitor instead of ceramic ? Is the all capacitors are electrolytic ? Can i use myler condensers for this ? can i get a good quality bass from this circuit? i build this circuit but filterd sub outs some voice also… not only bass.. i dont know why..when i connect only sub woofer without Left Right channels..it should out bass saoun no? help me please..
No ready made PCB is available with us. the IC used are two numbers TL074 and one no TL072, You can use standard IC group board. Anyone have the PCB for this circuit. At present you can use standard IC universal board for U1 to U4 use one TL074 similarly for U5 and U6 use TL072 and for U7 to U10 use One TL074. The layout will be quite good easy. Please try yourself. hello Setharaman,where is this subwoofer uotput, u7, connected? Hi Sanpreetsingh use TL074 2nos and one no TL072 for the total of 10 opamps. kindly refer to the notes just below the project circuit diagram. For TL074 4 + and 11-, for TL072 4 + and 8 -. can any buddy tell me where to connet for this cirkit power supply 9 volt and u1 to u10 which ic used. Hi Nitheesh connect the Left and Right input of the amplifier to this filter and the Left and Right output of this filter to your stereo Amplifier. Sub woofer output of the filter, you connect to a good sub woofer amplifier, 40Watts RMS power or higher power amplifier. (you can use the sub woofer amplifier appeared earlier in our site). Hi Sir, i have a separate tone control circuit and also a stereo amp circuit. what will be the set up if i’m going to add the above sub woofer filter? what i’m thinking is from audio source to this filter input(left and right) and the output of this filter to the input of the tone control circuit and the output of tone control to the input of the stereo amp and lastly to the speakers (left and right ). Hi Prasad the sub woofer filters will have a certain attenuation and also the sub woofer frequencies are felt not heared, hence you have to increase the gain of the sub woofer amplifier to suit your room acquestics. So you require a gaine stage after the filter before the amplifier that is called just as a gainer stage. Here U7 with R22 takes care of that function. Hi Vaibhav negative feed back is given to stabilise the amplifier and to maintain the amplification level, even though there are lots of component tolerenc in values and active components data spread in a wide range. you may go through the motional feed back amplifier appeared earlier in this column to understand how it improves the quality. feedback if yes then how? Hi Romesh except front left and right you will not have low frequency content in other channels hence they need not be included. Can I add 3 more channels (Rear-left, rear-right, centre) to this, And make a connection on each channel like U1 to U4 (or U8 to U4 they are similar anyway.)? Would it still work as expected? Thanks in advance. thank you sir, so if i will change it to lower value, the higher the frequency it will reproduce? im going to experiment on this one from available caps. for 0.12 you can use 0.1 and 0.02in parallel. If you use a higher value the low pass filter’s top end will come down. That is it reproduce lower frequency than it’s designed vale. say if it is to reproduce 30 to 180Hz it will reproduce 30 to 150Hz. what value of capacitor can be used to obtain the value of .18uf and .12uf bec. they are not available. is it necessary that those exact value are used? if i will use a little higher than those what might be the effect on the subwoofer output frequency. Hi Omer Left and right channel signals of stereo source is fed to the sub woofer filter and sub woofer filter out put signal is fed to this amplifier and the out put of this amplifier is fed to a good quality woofer (speaker with a very good low frequency response and prefarably its natural resonance below 30Hz). hi seetherman , i want to know that where the subwoofer circuit is connected? is it connected to input of this amplifier or at the out put? Hi Clark you are correct R2 should also be 4.7K. Hi Vithya Power is not a consideration frequency response is important. The requirement for the sub woofer system is that it must be in a position reproduce up to 160Hz nicely with clear punch as we do not really listen but feel the sound punch in these frequencies that is the reason for high power for the sub woofers. This Sub woofear circut can use 1200W power amp? hiii…this circuit looks good. But tell me is this of audiophyle quality..?? as i too want to make this. Also i think the resistances R2 & R15 should be of equal value either 4.7k or 47k?? Kindly confirm which one is the right value. Hi Soumya you can use this for sub woofer (around 40 to 100wattsRMS)which will be normally in the front any where. other 2 front and 2 rear can be 6 to 10Watts RMS amplifiers each. Can you please give a detailed description of TINY TERROR CIRCUIT. I have read about it in different places.,but didnt understand its real working.